In addition to reading the review below, you can listen to a podcast review of this film or subscribe to Bina007 Movie Reviews in iTunes. Dirk Simon's documentary on the political conflict between Tibet and China originally played the festival circuit in 2010. Since then, it's IMDB page has been blocked in China, and it is only now getting a theatrical release in the UK. The way it plays is as a straightforward agit-doc, unashamedly presenting the cause of the victimised invaded Tibet, with its fragile culture deliberately and methodically stamped out by the Chinese. I have been quite scornful of this kind of film in the past. I always wonder whether anyone who wasn't always convinced of the case would choose to see a film on that subject. But this documentary is different. In this case, I feel that even those of us in the west who have a sort of kneejerk response to support Tibet in some vague manner, are getting an education into what's really going on with that cause. Moreover, given the length of time the film took to assemble, its patient interviews with many Tibetans inside the cause, we get insight that is not readily available elsewhere. The documentary has three key messages for us. The first is the most obvious: Tibet was an independent country in 1912, and was invaded by the Chinese in 1950. It is entitled to its independence. The second key message is that Tibet is almost uniquely ill-equipped to fight for that independence. It has a deeply entrenched state religion that is committed to peace - so much so that the Dalai Lama called the resistance fight to a halt. It also has a still respected aristocracy whose scion is now a young teenager with little guidance, much doubt and great expectations of him. There is a powerful scene where the boy goes to the state oracle for advise and is given the banal instruction to follow the Dalai Lama, who has himself just admitted that the fight for independence has failed, the compromise fight for autonomy has failed, and now he looks to his people for answers, just as they look to him. Therein lies the contradiction of the Tibetan struggle. They are fighting for modern liberal values from the starting position of a feudal, hierarchical, religious monarchy and the very power structures they seek to preserve as their culture are holding them back from protecting it. The third key message is that China is not going to negotiate and the West is not going to intervene. Just as in 1950, when the West cosied up to Mao hoping to provoke a Sino-Soviet split, today the West needs Chinese trade. And as for China, she is playing a patient waiting game, for the Dalai Lama to die - and for all the resettled Han Chinese to dominate and dilute the Tibetan culture. The overwhelming feeling at the end of this sometimes frustratingly edited and arguably overlong documentary is one of having been given valuable insight but also a sense of hopelessness. There is a young Tibetan girl who is reduced to tears asking the interviewer what they should do. Former resistance fighters want a campaign of civil disobedience at the cost of lives. The Dalai Lama feels that would be hopeless against the massive Chinese numbers. Both sides are right. And our minds are cast back to the opening scenes of the doc - where Richard Gere and Archbishop Desmond Tutu speak at a rally - and it all seems rather futile. One wonders then, whether this documentary is also futile. Educating ourselves about the struggle that we know is likely to fail. It is depressing and yet utterly morally necessary. 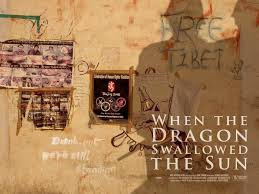 WHEN THE DRAGON SWALLOWED THE SUN has a running time of 115 minutes and is rated 15 for the real images of tortured Tibetans. The film will be released in the UK on August 16th.